Have you ever wished you could ask a reference question in real time and from where you are studying? Maybe you just can’t find where to find the conversion table in the Federal Practice Digest or you can’t figure out what a treatise is. Or perhaps that draft of your course paper is coming due and you can’t find the relevant subject materials. Our new virtual reference/chat service, AskThom, should be helpful to everyone – from those of you currently in legal writing class to those who are taking upper level paper classes. The URL to AskThom is: http://refchatter.net/chat/tjslref@chat.refchatter.net. AskThom will be available on Monday through Friday, from 9 am to 6 pm. At other times, feel free to e-mail Jane or Patrick. 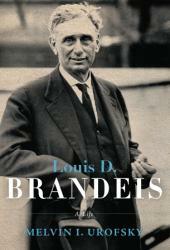 From the Publisher: Louis Dembitz Brandeis had at least four “careers.” As a lawyer in the late nineteenth and early twentieth centuries, he pioneered how modern law is practiced. He, and others, developed the modern law firm, in which specialists manage different areas of the law. He was the author of the right to privacy; led the way in creating the role of the lawyer as counselor; and pioneered the idea of pro bono publico work by attorneys. As late as 1916, when Brandeis was nominated to the Supreme Court, the idea of pro bono service still struck many old-time attorneys as somewhat radical. Between 1895 and 1916, when Woodrow Wilson named Brandeis to the Supreme Court, he ranked as one of the nation’s leading progressive reformers. Brandeis invented savings bank life insurance in Massachusetts (he considered it his most important contribution to the public weal) and was a driving force in the development of the Federal Reserve Act, the Clayton Antitrust Act, and the law establishing the Federal Trade Commission. […] Brandeis as an economist and moralist warned in 1914 that banking and stock brokering must be separate, and twenty years later, during the New Deal, his recommendation was finally enacted into law (the Glass-Steagall Act of 1933) but was undone by Ronald Reagan, which led to the savings-and-loan crisis in the 1980s and the world financial collapse of 2008. We see the brutal six-month confirmation battle after Wilson named the fifty-nine-year-old Brandeis to the court in 1916; the bitter fight between progressives and conservative leaders of the bar, finance, and manufacturing, who, while never directly attacking him as a Jew, described Brandeis as “a striver,” “selfadvertiser,” “a disturbing element in any gentleman’s club.” Even the president of Harvard, A. Lawrence Lowell, signed a petition accusing Brandeis of lacking “judicial temperament.” And we see, finally, how, during his twenty-three years on the court, this giant of a man and an intellect developed the modern jurisprudence of free speech, the doctrine of a constitutionally protected right to privacy, and suggested what became known as the doctrine of incorporation, by which the Bill of Rights came to apply to the states. Brandeis took his seat when the old classical jurisprudence still held sway, and he tried to teach both his colleagues and the public– especially the law schools–that the law had to change to keep up with the economy and society. Brandeis often said, “My faith in time is great.” Eventually the Supreme Court adopted every one of his dissents as the correct constitutional interpretation. A huge and galvanizing biography, a revelation of one man’s effect on American society and jurisprudence, and the electrifying story of his time. From the Publisher: Harry A. Blackmun: The Outsider Justice is Tinsley E. Yarbrough’s penetrating account of one of the most outspoken and complicated figures on the Supreme Court. As a justice, Blackmun stood at the pinnacle of the American judiciary. Yet when he took his seat on the Court, Justice Blackmun felt “almost desperate,” overwhelmed with feelings of self-doubt and inadequacy over the immense responsibilities before him. Blackmun had overcome humble roots to achieve a Harvard education, success as a Minneapolis lawyer and resident counsel to the prestigious Mayo Clinic, as well as a distinguished record on the Eighth Circuit federal appeals court. But growing up in a financially unstable home with a frequently unemployed father and an emotionally fragile mother left a permanent mark on the future justice. All his life, Harry Blackmun considered himself one of society’s outsiders, someone who did not “belong. Remarkably, though, that very self-image instilled in the justice, throughout his career, a deep empathy for society’s most vulnerable outsiders–women faced with unwanted pregnancies, homosexuals subjected to archaic laws, and ultimately, death-row inmates. To those who saw his career as the constitutional odyssey of a conservative jurist gradually transformed into a champion of the underdog, Blackmun had a ready answer: he had not changed; the Court and the issues before them changed. The justice’s identification with the marginalized members of society arguably provides the overarching key to that consistency. From the Publisher: Sonia Sotomayor is the first Hispanic woman to be nominated to the Supreme Court of the United States. The Bronx-born Puerto Rican is an embodiment of the American Dream, working hard since childhood to rise from poverty to wealth and influence. With a strong Democratic majority in the Senate, she should easily be confirmed. So, who is the woman well-positioned to become the next Supreme Court Justice? Where did she come from and how did she reach this point in her career? Most importantly, what does she believe, and what might Americans expect from her as a judge? 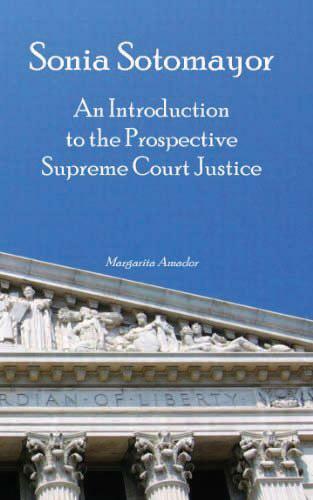 Sonia Sotomayor: An Introduction to the Prospective Supreme Court Justice is an overview of her inspiring life story, a record of some of her major decisions as a judge, and a brief sample of the dramatic controversy which has accompanied her nomination. 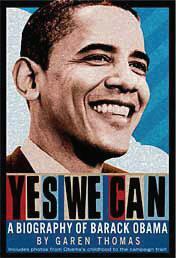 From the Publisher: In third grade, Barack Obama wrote an essay titled, “I Want to Become President”— and he is, to this day, determined to show the world that, yes, he can. Born in the U.S.A., the son of an African father and an American mother, a boy who spent his childhood in Indonesia and Hawaii, Barack Obama is truly a citizen of the world. His campaign for the presidency is powered by a fierce optimism, an exuberant sense of purpose and determination, and, above all, a belief that change can happen. Garen Thomas takes us through the life of Barack Obama, from his struggle to fit in with his classmates and concern about not knowing his biological father, through his term as Illinois senator, to his historic and momentum-building run for president of the United States. Barack Obama is a man who uses his words to inspire us. We can have a better future. We can be whatever we want to be. Yes. We. Can. This issue is dedicated to helping you succeed on your midterms. We hope that you find this issue to be of use. Good luck! The Study Aids section is located just past the reference librarian office on the first floor. This section is comprised of what your fellow students feel are the most useful study aid materials. Consult our study guide key to determine which series of materials includes multiple choice and essay questions, subject outlines and topical narration. As a means keeping these materials available to our whole student body, the check out period for all materials in this section is limited to 48 hours. So please be cognizant of the due date. We purchase copies of your required and optional course books and place them behind the circulation desk in the course reserves section. This section exists to benefit every class member, so the check out time is limited to three hours. Just ask at the circulation desk for the book by title and by course name. Virtual Reference Coming Next Week! Starting next week, look for AskThom, our virtual chat service, which will allow you to ask live reference questions from wherever you are. Look for the link on the library homepage. Throughout this trial period, we’ll assess the efficacy of this service in order to determine if it’ll be permanent. The group study rooms on the second floor are in particular demand during midterms and finals. In order for your reservation to go smoothly, please be sure that you check in at the circulation desk and leave your TJSL ID. Also please be sure to check out at the desk so the study room key will be available for the next student. These popular rooms are available for same day use. You may reserve a room for two hours either in person at the circulation desk, or by phone at 619-297-9700 x1100. Only same day reservations are available. Because these rooms are in high demand, we must adhere to the 10 minute rule. So please show up promptly or after 10 minutes we will release the reservation. The sample chairs under consideration for the new building will soon be returned. Come by and try them out at the round tables on the first floor of the library, just outside the copier room. TJSL values your opinion, so take this opportunity to help make your new school a more pleasant and engaging learning environment. Please be sure to review the chair selection and then provide your feedback. You may find updates on the library blog, ThomChat, which focuses on technology and legal developments. Recent posts have focused on the Americans with Disabilities Act, the practice of law, freedom of information, and law firm legal research requirements. You’ll also find current news on a compilation of sundry legal topics at the Current News/Recent Cases RSS page. Just click onto your topic from the left side table of contents and multiple subject-specific RSS feeds will populate the right side of the screen. It’s a great way to keep updated on your paper topic. We’ve created a new section near the reference librarian offices for those who need to tackle real life legal situations. Perhaps you have an issue with your landlord, or you’re not quite sure how to answer that legal question from your relative. Or maybe you want to know how to set up your side business. This section, located along side the Study Aids section, is primarily comprised of the popular Nolo Press books. This annual observance celebrates lesbian, gay, bisexual and transgender history as well as the history of the gay rights and related civil rights movements. LGBT History Month is intended to encourage honesty and openness about being lesbian, gay, bisexual or transgender. 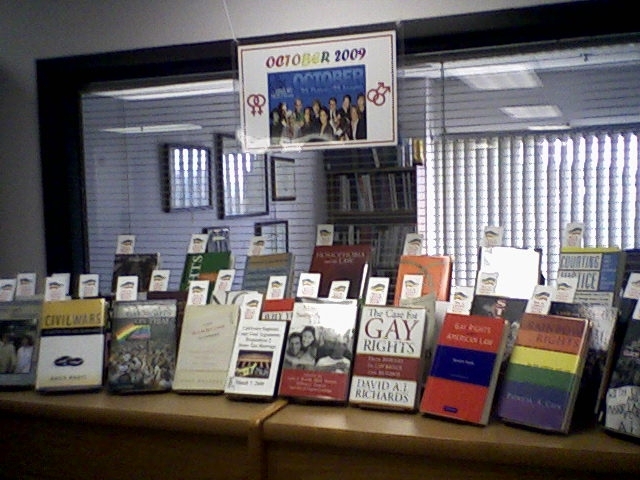 Check out our display of library materials celebrating this history over the last 40 years. LGBT History Month is a month-long annual observance of lesbian, gay, bisexual and transgender history, and the history of the gay rights and related civil rights movements. It is observed during October in the United States, to include National Coming Out Day on October 11. LGBT History Month originated in the United States and was first celebrated in 1994. It was founded by Missouri high-school history teacher Rodney Wilson. Among early supporters and members of the first coordinating committee were Kevin Jennings of the Gay, Lesbian and Straight Education Network (GLSEN); Kevin Boyer of Gerber/Hart Gay and Lesbian Library and Archives in Chicago; Paul Varnell, writer for the Windy City Times; Torey Wilson, Chicago area teacher; Johnda Boyce, women’s studies major at Columbus State University and Jessea Greenman of UC-Berkeley. Many gay and lesbian organizations supported the concept early on. October also commemorates the first march on Washington by LGBT people in 1979. LGBT History Month is intended to encourage honesty and openness about being lesbian, gay, bisexual or transgender. Come by the Library Lobby and check out our display of library materials celebrating the history of the gay, lesbian, bisexual, and transgender community over the last 40 years.